If you are part of the technology startup ecosystem, the book Antifragility: Things that Benefit from Disorder by Nassim Nicholas Taleb had a special resonance, because you saw yourselves everywhere in it. For starters, the technology startup ecosystem reeks of Antifragility, and that’s a very good thing. Antifragility is a solution to Taleb’s original depiction of The Black Swan problem—the impossibility of calculating the risks of consequential rare events and predicting their occurrence. 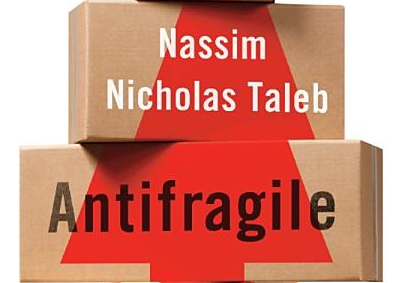 In this follow-up book, Taleb proposes rules for moving from the fragile towards the antifragile via a reduction of fragility or by harnessing antifragility. After looking at Taleb’s principles, I came to the conclusion that the startup ecosystem is the quintessential antifragile system. If there was a poster depiction of an antifragile creature, it's the tech startup itself. Startups are born immature and shapeless, but with every experimentation, evolution, release, feedback, setback or failure, they become stronger. Each iteration aligns it better on the right path, and every small mistake that is corrected or avoided makes it stronger. Relating to the tech ecosystem, in the area of Finance, Taleb labels Venture Capital as Antifragile, whereas Debt is Fragile, and Equity is Robust. In Business, the New York-based Banking System is in the “Fragile” bucket, and at the opposite end, typifying the Antifragile, you will see the Silicon Valley “Fail fast, be foolish” model. Let’s see how Antifragility applies to entrepreneurship and the tech startup ecosystem. 1) Decentralized system. The startup ecosystem with all its players, from VCs to startups, and anything in-between is very decentralized. Why is this important? Because one failure doesn’t propagate into the system. “You want the errors to be spread out”. Over centralization is not good. Errors make the rest of the rest of the network stronger, because those who have failed and learned become better entrepreneurs. 3) Surviving Uncertainty. Startups survive uncertainty on a daily basis, and they also thrive on it, because it’s their normal environment. Every time you get feedback on your iterations, you’re uncovering another level of visibility about where your business is going. 4) Unharmful volatility. Getting in trouble is OK. Innovate by getting in trouble. So many startups are getting in trouble, mostly in the seed stages. But these troubles aren’t harmful to the system. “Volatility cleans up the system from harmful material”. If a VC fund or startup doesn’t perform well, that doesn’t bring the whole system down. 5) Constant bottoms-up tinkering. Bottoms up tinkering and trial and errors benefits from uncertainty. In the startup world, so much is learned from small experimentation that lets you tinker, keeping what works and throwing out what doesn’t. This tinkering later evolves to become lessons. Taleb says: “Business plans are like getting on a highway with no exits. Tinkering is like getting on a highway with so many exits- you can exit whenever you want and discover something new”. Tell that to the next VC who asks you for a business plan. 6) Skin in the game. That is the best form of risk management. The feedback loop must be able to directly hurt you or reward you. Imagine if the VCs were immune to their success or failures and received a bonus every year no matter what. Imagine entrepreneurs that don’t benefit from the upside nor get hurt from downsides (via liquidation preferences for example). Skin in the game is part and parcels of startups, entrepreneurs and VC’s. 7) Embrace fragility but know its boundaries. Take the highest levels of risks early, and progressively less as you go into higher stages. That’s the whole raison d’etre of the steps behind a venture-backed company that goes from seed, to angel, to Series A, B, C, D, etc. There is de-risking at every subsequent stage. 8) Big gains from a small sample. You are harmed much less by an error than you can benefit from it. That’s the driving force behind VC investing. They take the risk, but they also benefit from it. If you analyzed any VC portfolio, the biggest gains come from a small number of companies they invest in. “More Gain than Pain from a Random Event.” Let’s be realistic: the exit is a “random event”. Lessons for the next pre-Bubble Since most startups fail fast and fail early at a minimum cost to others, it’s normal to see lots of seed level funding. Most Angels or early-stage VC’s that invest at the Seed levels are prepared to lose that money. It’s something that entrepreneurs don’t know, ignore or don’t want to hear. Only a few will make it to raise more money, and the bar gets raised higher at each subsequent funding while the risks get lowered accordingly. The startup ecosystem will remain antifragile as long as failures are contained at the early cycles of evolution where it doesn’t affect others as much. In 2000, the biggest mistake of that bubble occurred when companies started to fail higher on the “hurt scale” and that affected almost everybody. The minute companies started to go public too early (lead by Netscape), and many of them without revenues, their subsequent failures started to affect millions of others, and that was the beginning of the end. Had most companies not gone public as early as they did in 2000, we wouldn’t have had a bursting of a bubble because many of them who were going to fail anyways wouldn’t have spread the effects of these failures on the rest of the world by creating a negative environment. The other domino effect mistake of the 2000 bubble occurred when companies started fixing their valuations based on others that preceded them, and the minute you start to do that, the system starts to self-inflate itself and undoing that becomes very problematic. The bubble happened when we became interdependent on high valuations before these businesses had a chance to prove their sustainability. These companies were too small to succeed given the high bar that was placed for them, but their fail effects were far enough to infect many many others. The more you look at the chaotic nature of the VC business, the more you will see that we didn’t arrive to where we are via order. And that’s great. Remember, the sub-title of that book is “Things that benefit from disorder”. Show me 2 VC deals or startups that are exactly the same. Now you understand why the VC / startup ecosystem is so disorderly, yet totally Antifragile. Author, The Business Blockchain (Wiley, 2016). Investor. Analyst. Speaker. Startup Management. 3x entrepreneur. HP, Cognizant. Blockchain theorist & strategist.